HTML5 is the fifth revision of the standard HTML which was officially issued by the W3C (World Wide Web Consortium). HTML5 is a markup language that serves to structure and display the contents of the world wide web. The goal of developing a HTML5 is to fix the HTML technology to provide support for multimedia technology. With HTML5, adding media like video or audio on the web application is simpler because unlike HTML4 should add plugins such as Flash and Silverlight to add multimedia support.Thus the use of HTML5 is expected to reduce the need for external plugins such as flash and others. While HTML5 has been updated from earlier versions of HTML, Web developers need to consider browser support and the difference in function between HTML5 and Flash. 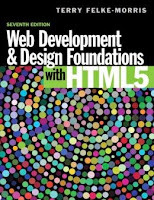 "Web Development and Design Foundations with HTML5 7th Edition" is textbook that provides guidance in learning HTML5 for web developers who started migrating from XHTML. 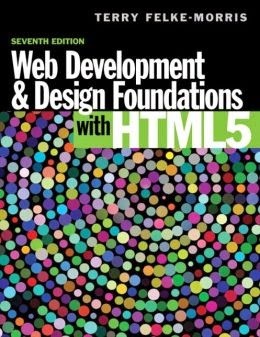 The book provides the foundation of the concepts and skills needed for Web developers.This is a continuation of the Sixth Edition to integrate HTML and CSS. The book also provides the motivation to practice from start to finish the chapter and also a case study to develop the websites for real. The book provides a strong concept with the emphasis on web design, accessibility, and ethics.